Research shows that fusions may be on the way out, as they’ve failed to show any clinical value. Send me daily blog updates. Send me weekly blog updates. Do you have spine pain? Have you been recommended to get a spinal fusion? There has been an explosion in low back and neck fusion surgeries in the past two decades, however fusion surgery should be your absolute last option. Research shows that fusions may be on the way out, as they’ve failed to show any clinical value. At the Centeno-Schultz Clinic, we offer a range of stem cell and platelet procedures that we’ve developed to help patients avoid fusion surgery. These treatments utilize the patient’s own natural growth factors to treat bulging / herniated discs, degenerative conditions in the spine, and other back or neck conditions that cause pain. Spinal Fusion Surgery Should be Your Last Option. Why? Given that the spine was designed to be in motion and still needs to move no matter what we do to parts of it, it’s easy to see that locking down any one or more levels just overloads the adjacent levels. In fact, the breakdown of these adjacent segments is so common after spinal surgery that there’s now something called “adjacent segment disease” (ASD). This means that because of the fusion, the next level or two up or down degenerates more rapidly due to the lack of motion in the fused area. Does spinal fusion actually work? The short answer is: No. Given the incredible invasiveness of bolting the spine together and the huge cost of these surgeries and the fact that we know that ASD is real, you would think there was incredible evidence that the surgery works. If you are considering a fusion, it’s important that you have as much information as possible, so you can make the right decision for you. Are there some patients who really should get a fusion? 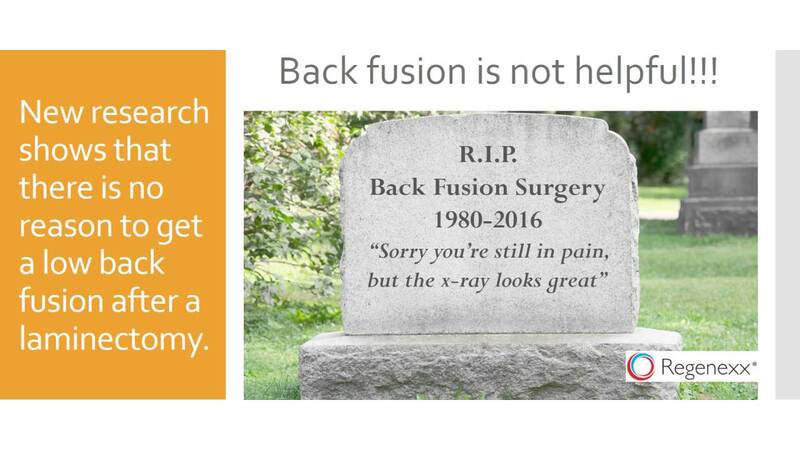 Yes, but out of every 100 patients we see who have had a fusion, only 1 or 2 really need them as there are nonsurgical therapies that would have been effective alternatives. Surgery for spinal stenosis has already been found to be no more effective for pain and function than physical therapy. Studies show that back fusion is no better than physical therapy. Patients who underwent a back fusion due to spinal stenosis had no better outcomes at two and five years following surgery than those who just had a laminectomy (decompression, or opening up the bony area around a pinched nerve). After a fusion, adjacent segment disease (ASD), caused by the increased stress and pressure on spinal segments above and below the fusion, is sure to follow. What is the Better Option? Avoid Surgery and Find Relief with Interventional Orthopedics. Everything within the body works together, like a precisely tuned symphony, to support our well-being, and a healthy spine and all its component parts (e.g., spinal nerves, ligaments, muscles, etc.) are critical to full-body health. When a single component in the spinal chain is damaged, it can lead to a cascade of problems not only in the musculoskeletal system but throughout the body and even further spinal damage when it goes untreated. The result is chronic pain anywhere in the body that with the proper diagnostic approach can be traced back to the damage in the spine. At the Centeno-Schultz Clinic, our processing allows us to custom tailor our regenerative mixtures for your spine condition and our patented two-tier processing results in 10 to 20 times more growth factors available for your treatment compared to other practices. Our Regenexx procedures offer a variety of minimally invasive procedures that deliver ultra-precise spinal injections of platelet lysates or stem cells where needed, utilizing advanced image guidance. We are 100% focused on helping you avoid back pain and life altering surgery to achieve the best possible outcomes. After 2 back surgeries I could not enjoy the everyday activities that you should be able at the age of 36. Riding a bike, going up and down stairs, just going on a walk with my wife hurt. I was unable to stand and work for more than a couple hours. You get the idea… two days after my last injection I woke up with no pain. My wife and I went on a 5-mile bike ride and a 3-mile hike. I was in tears of joy. I could not have asked for better results. I my new life to you Dr. Pitts. Thank you so much! I have seen Dr. Centeno for my lower back. Results have been outstanding. I have passed his name and clinic on to numerous friends and acquaintances without reservation. Very professional office staff—extremely well organized, efficient. Centeno-Schultz Clinic a wonderful facility for pain management. I’ve been seeing doctor Schultz for many years for my back pain. He is very professional and knowledgeable. Dr. Schultz has helped me tremendously. I would definitely recommend him and his facility.